This illustration represents the best evidence to date that the direct collapse of a gas cloud produced supermassive black holes in the early Universe. Researchers combined data from NASA’s Chandra, Hubble, and Spitzer telescopes to make this discovery. 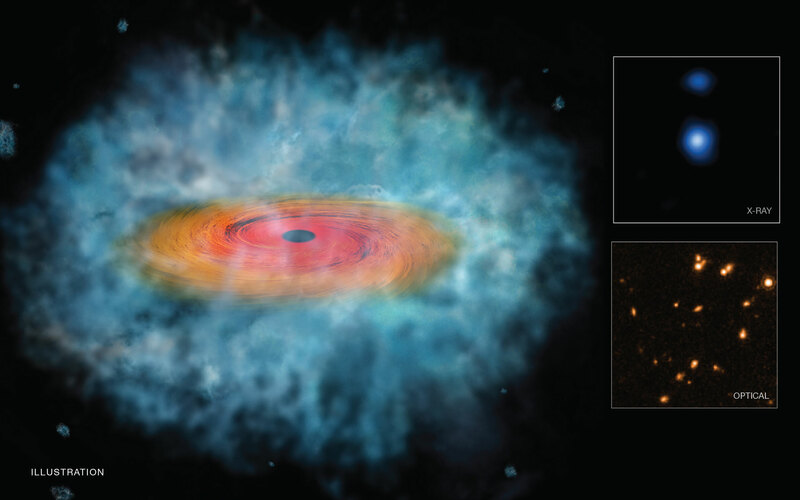 Using the combined data from Chandra, Hubble, and Spitzer, atronomers have found evidence that some early supermassive black holes formed directly from the collapse of a gas cloud. Astronomers have found the best evidence yet for cosmic seeds in the early universe that should grow into supermassive black holes. Researchers combined data from NASA’s Chandra X-ray Observatory, Hubble Space Telescope, and Spitzer Space Telescope to identify these possible black hole seeds. They discuss their findings in the Monthly Notices of the Royal Astronomical Society. 2 Comments on "Astronomers Discover Clues For How Giant Black Holes Formed So Quickly"
from the little I have read ,scientist are really moving fast in discovery and I am just really happy reading this discovery.I Wii be very pleased if I can just be invited be any of this scientists or institute just to learn from them.kudos Cruz you are very right.